Toni’s last post here was the amazingly useful Are You Making These 7 Book Marketing Mistakes? Today she tackles one of the obstacles that confronts many authors: procrastination. She’s got a lot of tips, so do yourself a favor and don’t delay—read this article now. You’ll be glad you did. On a scale from 1-10, how dedicated is your biggest fan? Maybe she’s an 8, who eagerly awaits the arrival of your newsletter in her inbox. Or perhaps he’s a 9, who happily tweets about your latest blog post. Or is she a 10, who excitedly marks her calendar for the release of your next book (and reminds all of her friends to grab their copy)? If your answer isn’t as high as you’d like, you’re certainly not alone. Many of your author brethren also suffer from the lack of a dedicated fanbase, and, in my opinion, it’s the leading cause of those *shudder* book flops. Doesn’t your book deserve better? Look, I get it: everything involved in the writing and publishing process takes time. A lot of time. When publication finally draws near, your patience wears thin: you’re sick of all of the decisions, the late nights, and the stress. You simply want to sit back and take a moment to enjoy your success. As a result, some things get pushed to the wayside. Like that author website you know you need to build. Or that mailing list you thought about creating. Or accounts on all those social networks everyone’s always going on about. It doesn’t feel like there are enough hours in the day to fit it all in, right? And when it comes time to throw a task to the wayside, admit it: the seemingly overwhelming, icky and (worst of all) boring world of book marketing is first on the list. Reality check: your book won’t be a success without readers who love it. And you won’t have the writing career of your dreams unless some of them decide you’re pretty awesome, too. So if you’ve ever found yourself putting off book promotion day after day, I’m here to make sure that ends today. You’re going to stop procrastinating and start building a following of readers who adore your work – right now. The best part? Once you get your feet wet, building your fanbase is actually easy and fun! Ready to get started? While the fact that it takes three weeks to form a habit is up to some debate, we can all agree that doing any task over and over again makes it feel less cumbersome and more automatic. That’s why your first fanbase-building baby step is to start building a book promotion habit. The best part? Starting small is totally encouraged! Aim for a few 15-minute sessions your first week. Schedule them in just like a doctor’s appointment or important work meeting – they’re that important. Once you’re eager for more, add some time (or sessions) into the mix during the following week. Before you know it, working on promotion becomes as automatic as brushing your teeth or watching Game of Thrones. How would you describe your readers? I bet your first instinct is to reach for your trusty target market information: 18-34 year-old women living in the city, college-educated…something like that, right? But that’s not what I want to hear! Instead, I want you to imagine the group of folks who’d love your book and pick out ONE person. I’m serious! Picture one member of your target market in your mind. Your biggest fan.The person who would sing the praises of your book from the rooftops. Now, describe her. Give her a name. A backstory. A life. When you narrow down your target market to your #1 fan, it’s much easier to figure out what makes her tick. How did she come across your book? Why did she choose to read it? Where can you find others like her? Once you meet your biggest fan, you can come back to her whenever you’re searching for book marketing direction. Okay, I know that sounds a little nefarious and “James Bond-y,” but hear me out. Instead of trying to reinvent the ol’ book promotion wheel, check out what other authors in your genre are doing to promote their work. How are they interacting with their fans? Where are they focusing their book marketing attention? Taking the time to do this research will help you spark ideas and craft a more effective fanbase-building strategy. I do want to caution you, however, against directly copying other authors’ updates or strategies. You’ll get the best results by gathering inspiration from their work and then adapting it to fit your personality and your readers’ interests. From the moment you dip your toe into the book marketing ocean, you’re bombarded by a wide variety of promotional techniques. It’s enough to make your head spin: Do you start tweeting? Blogging? Building a Facebook fan page? Creating a mailing list? Unless you have a plethora of free time and/or money, there’s no way you can tackle the entire gamut of fanbase-building techniques at once. You know what whole “jack of all trades, master of none” cliché? Well, it most definitely applies here. Or, you know…any one of the bajillion other book marketing techniques out there. While focusing your attention in this way can make your fanbase-building efforts feel slower than you’d like, think of the long-term result: after 6 months of tackling just one task a month, you’d have completed every task on the above list. Sounds pretty good, right? This is, by far, the best book promotion tip I could ever share. Unless you’re lightning-strike lucky, the odds of your book automagically becoming a raging success are slim. You have to want that success and, even more than that, be willing to put in the work it takes to get there. No matter what, just show up. Keep your book marketing appointment. Sit down in front of the computer and see what happens. If you accomplish everything you wanted to, super! If you spend the whole time simply staring at the screen, that’s okay, too. Simply keep moving forward, session after session, day after day. Whatever you do, don’t give up. A fanbase full of those crazy-dedicated fans is within your reach, but it’s up to you to stop procrastinating and take the first step. Do you struggle to find time to work on building your fanbase? Do some tasks come easier than others? 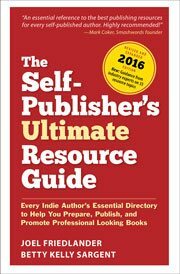 What’s holding you back from the publishing success you’ve imagined? Let’s discuss in the comments! Toni Tesori is one half of Duolit, two gals who help passionate fiction authors sell more books by building their crazy-dedicated fanbase. If you’re ready to stop dreading and start loving the process of book promotion, check out their Free Weekend Book Marketing Makeover, a guided workbook that jumpstarts your fanbase-building efforts in just two days! YEAH!!! I am a twelve year old who probably won’t be doing any promoting sessions because no one wants to listen to someone that old rambling about a book they wrote… But the website idea is great, along with the social networking, SO PEOPLE BEWARE OF THE FIRST BOOK OF THE SPIRIT WOLF SERIES; WOLFHEART!!!!!!! I love the title of your series, and wish you continued motivation and determination to complete that first book (and then the rest, of course.) my book, Howl, is being released in may 2015 and tells the story of the wolf controversy raging across our nation ~ wolves are incredible, and you obviously agree! I registered a couple of free blog addresses but haven’t added anything to them yet. I am afraid of meeting new people online and am very shy. Just reading this article made me tense up. I think the “just do it” part would scare me the most. I’d need to have some sort of safety buffer between myself and the scary unknowns out there, the savage masses of the digital Roman coliseum who can send me to the lions and tear me to shreds. Is there such thing as a company who will socialize for you or is this anathema to the whole “social” ideology of social media? Guest, there are many people who blog under a pen name or other “alias” and that’s a perfectly fine way to do it. It would be better to stay anonymous but do your own interacting and writing, because then the “voice” of your marketing will be authentic. I am looking for blogs by authors of children’s picture books. I love your idea about creating your biggest fan and searching out blogs, etc (I read your book and made copious notes). My problem is I write in multiple genres, and I am completely overwhelmed with the task of doing it for each. I’ve also tried to find blogs and am woefully bad at it. My social media marketing is good, my blog is good, my paid promo stuff is going well. But that… and building a mailing list (and then actually sending anything out, because hey, I’m doing a blog – go there!). It’s always something, right?? Great reminder to stay focused and just do it, thanks! I’ve done most everything suggested except that pesky email list. I know. I know. It’s important. I’m not sure what’s been stopping me: my loathing for marketing, laziness, or fear of the technology. Great suggestions. I find that the main thing that holds me back is being overwhelmed by all of the different options and the need to learn about them. Suggestion 4 is one that I am going to implement starting now. is exactly the reminder I need. With so many options, it’s easy to fall into the trap of continuing to research what’s out there and not really START something. You’re exactly right, Carol. It’s so easy to become overwhelmed by the breadth of your options that you end up frozen — and (though I know this sounds obvious) doing nothing is the absolute *worst* way to build your fanbase! Make a commitment to choose one thing, today, and simply get started. I think you’ll find after first step that the following ones become easier and easier. Best wishes and thank you so much for reading!